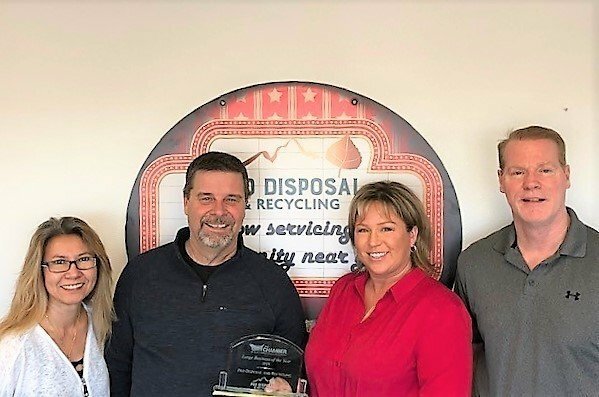 HENDERSON, Colo. (Feb. 4 2019) Pro Disposal & Recycling, one of the largest residential waste and recycling haulers in the Denver area, has received recognitionfrom the Chamber of Northwest Douglas County as this years Best Large Business. The award goes to the company that has more than 50 employees and that best exemplifies the Chambers commitment to the highest integrity in business practices. Pro Disposal & Recycling accepted the award recently at the Chambers annual luncheon in Lone Tree. Of all the awards we have won in recent years, none means more to us than this one from the Chamber, because it comes from a group of savvy business people who know Pro Disposal & Recycling better than anyone, said Rick DePaiva, district manager of Pro Disposal & Recycling. We interact regularly, and many of them are Pro Disposal & Recycling customers, so they know the true extent of our commitment to customer service, business ethics and community involvement. Pro Disposal & Recycling has been a Chamber member for eight years. The company operates in 14 cities around the Denver metro area, but it has a concentration of business in the area served by the Chamber, including service that Pro Disposal & Recycling provides for the official operations of Douglas County administrators. Pro Disposal & Recycling is always on the forefront of the Chambers efforts to unite the hundreds of businesses and transform that unity into a dependable resource for everyone, said Tim Lindsey, owner of Bear Mortgage and chairman of the Chamber Board of Directors. We are happy to recognize Pro Disposal & Recycling with this award. Founded in 1999 and based in Henderson, Colo., Pro Disposal & Recycling provides trash, recycling androll-off services to residential customers throughout the greater Denver area, servicing more than 90,000 homes per week. Pro Disposal & Recycling provides commercial services to businesses in Douglas, Arapahoe and Adams counties. Pro Disposal is the only waste hauling company in the Denver area that offers Elite Pro Service, in which drivers return empty trash cans to a homes garage area, with capacity for unlimited household trash and up to 15 bags of yard waste. Pro Disposal & Recycling maintains membership in four Chambers of Commerce in the Denver area, plus various civic organizations. Colorado Community Media has recognized Pro Disposal & Recycling as Best of the Best for its services in multiple communities in recent years. Pro Disposal & Recyclings service in Lone Tree, Colo., was recognized in 2017 as best in the nation. For information, go to www.ProDisposal.net, or call 303-791-3827.